This is the processor that will power most of the high-end Android phones this year, and it sounds pretty good. After an accidental leak earlier in the day, Qualcomm just announced the details of its next high-end System-on-Chip (SoC), the Snapdragon 835. It’s a big deal: Most of the hottest phones that make headlines run on Qualcomm’s chips, and this is the one that we’re likely to see in the U.S. variant of the Galaxy S8 as well as the 2017 flagships from LG, HTC, Moto, and maybe even the next Pixel phone. The list of features is mind-numbingly long, but you don’t need to know all the little details. Here are the most important aspects of the new chip, and what they mean for the phones of 2017. Look at that photo above. 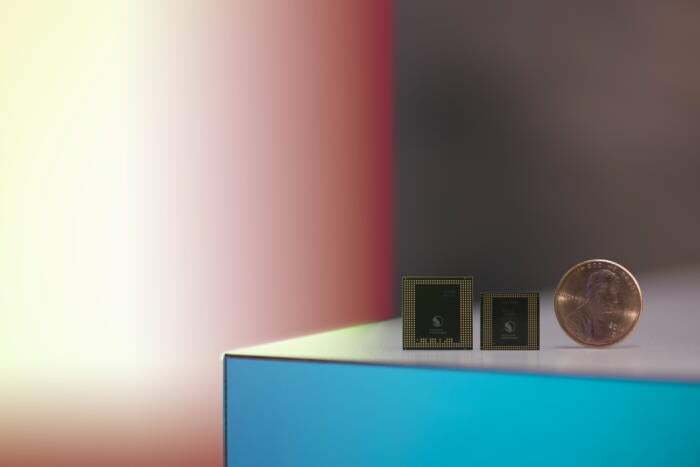 Both chips are smaller than a penny, but the larger chip is the Snapdragon 820—last year’s high-end chip. The Snapdragon 835, despite being faster and sporting more features, is significantly smaller. For this you can thank the leap to a 10nm manufacturing process (the 820 was made on the already-impressive 14nm process). Smaller, more tightly packed transistors are good for power consumption, too. The new Kyro 280 CPU has four high-performance cores running up to 2.45GHz and four low-power cores running up to 1.9GHz, which should be faster than the CPU in the Snapdragon 820. The Adreno 540 GPU is claimed to provide 25 percent faster 3D graphics (along with HDR and 10-bit display support). Despite all this extra performance, Qualcomm says the chip consumes 25 percent less power. Does this mean your phone will consume 25 percent less power? No, there are many other systems within your phone that draw power, with the display being one of the biggest. Still, more performance and lower power is good news. And maybe it means phones won’t get so hot when they run VR applications. A lot of variables go into making a great smartphone camera. When it comes to the image processing side, the Snapdragon 835 takes several important steps over earlier Qualcomm chips. It’s got dual 14-bit image signal processors (ISPs) that can handle either dual 16-megapixel cameras or a single 32-megapixel camera. Qualcomm has also improved its software algorithms that provide zooming and image stabilization, and the 835 supports dual photodiode and better hybrid autofocus. Some phone manufacturers develop their own image-processing software, but many simply use Qualcomm’s libraries (or start with those and modify them). So faster and more powerful image processing, with refined software algorithms, should be the rising tide that lifts all boats. The Snapdragon 835 integrates Qualcomm’s new X16 LTE model. That means 256-QAM, 4x Carrier Aggregation, and 4x4 MIMO antennas. That’s LTE category 16 for downloads and 13 for uploads. We’re talking about LTE download speeds of 1 gigabit and uploads of 150 megabits. Mind you, those are the peak speeds the chip is capable of. And it relies on your carrier supporting all those fancy technologies (right now, they mostly don’t). But think of it as future-proofing. As carriers upgrade their networks, this chip will be able to make use of the enhanced speeds (provided that your carrier issues the necessary software updates). On the Wi-Fi front, you’re looking at support for 4x4 MU-MIMO support on the integrated 802.11ac Wi-Fi adapter. Qualcomm says the chip “supports” 802.11ad as well, which is a really fast (and more power efficient) multi-gigabit Wi-Fi technology. But the company never says an 802.11ad modem is integrated into the chip, as they do with the 802.11ac modem. It’s likely that the chip just includes a path to support such external modems. What about the brand new Bluetooth 5.0 spec? Well, the Snapdragon 835 is the first certified Bluetooth 5.0 solution—when accompanied by the WCN 3990 companion chip. In other words, Bluetooth 5.0 isn’t built in, but this SoC together with a dedicated wireless chip will be among the first Bluetooth 5.0 solutions on the market. The current top-of-the-line Snapdragon chips will record 4K video at 30fps and play it back at 60fps, with support for both H.264 and HEVC. So what’s new? In addition to support for 4K displays, the new chip supports high dynamic range and 10-bit color gamuts. Those technologies aren’t common in smartphones, but with the surge in 4K and HDR in TVs, perhaps we’ll see more phones and tablets with HDR and wide color gamuts in 2017. This is Qualcomm’s first chip to support its new Quick Charge 4 technology, which promises five hours of “talk time” in five minutes of charging. That sort of statistic is all but useless, but QC 4 does seem like an improvement over QC 3. It’s said to be either 20 percent faster or 30 percent more efficient, while running 5 degrees cooler (Celsius) when charging. It also supports USB-C connectors and USB-PD power delivery, so that should help eliminate those chargers that either work with USB-PD charging or Quick Charge, but not both. As good as the Snapdragon 835 sounds, there’s nothing revolutionary here. It’s the next logical step as made possible by the new smaller 10nm process. It’s a faster CPU and GPU, and offers better image processing, better display support, and better charging in a smaller, lower-power chip. That’s all good news, but it’s not as though this is the first 5G chip or the first chip to make use of a crazy new CPU or GPU architecture, or a new memory technology, for a big leap forward. And of course, we can only go by Qualcomm’s claims right now. The first phones to use this chip will probably be released in a couple months (I suspect the Galaxy S8 will be one of the first). We don’t get to really put the chip through its paces until we get our hands on a phone.